On Wednesday, March 13th, MTA’s entire Freshman Grade enjoyed Freshman Fun Day! This exciting day included learning, informative guidance sessions, team building activities, and a fun trip to High Exposure. 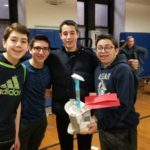 “Freshman Fun Day enables 9th Grade talmidim to bond together as a grade,” said Freshman Grade Dean Rabbi Eli Cohn. “It’s a great opportunity for the Freshmen to solidify existing friendships and develop new ones with boys who they may not share classes with, in addition to strengthening their relationships with their rebbeim.” Talmidim had a great day spending time with their rebbeim and making new friends.